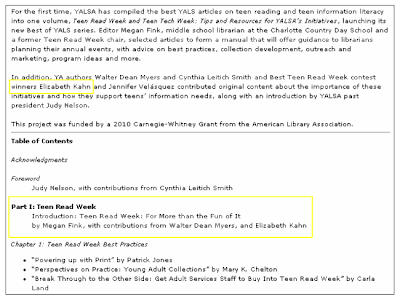 In 2008, I was asked to write an article for YALS, the quarterly journal published by the Young Adult Library Services Association. 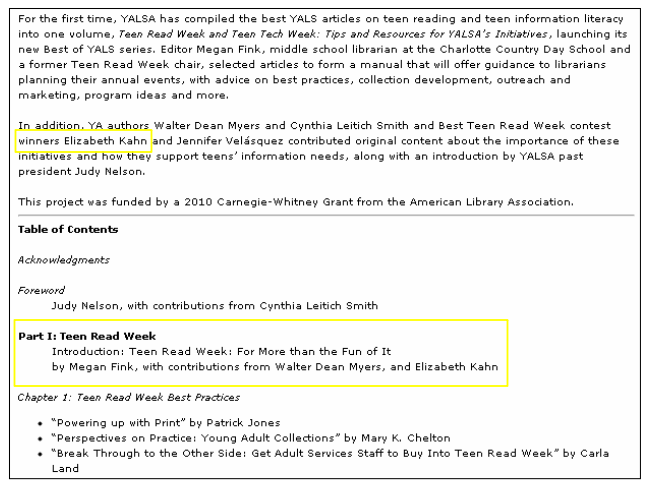 I had won the Teen Read Week author visit contest in October of 2007, and YALSA wanted documentation of that event for YALS. Patrick Taylor was the lucky recipient of a visit by author, Tiffany Trent. She had written the spooky, Hallowmere series. Her visit was the first time an author had graced the halls of Taylor. She spent the day with us, and it was an awesome experience. 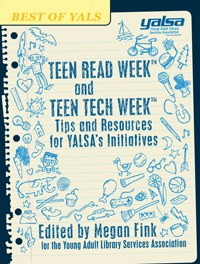 This past fall, I was asked to summarize the article as YALSA was putting together a book about Teen Read Week and Teen Tech Week. Now I am published in a book. Here is a blurb about the content from the book. As you can see, I have the honored position of being listed with Walter Dean Myers. If you double click the document below, you can enlarge it to a readable size.